Wow! What a whirlwind week: Christmas concert practice madness, a new role play area and a jaunt to Cardiff to see my hero, ABCdoes, in action. 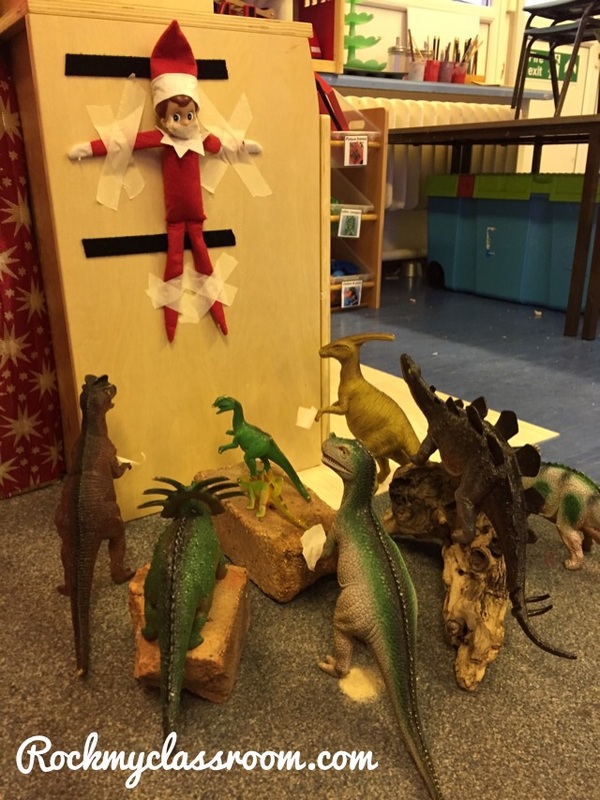 The biggest event of the week, however, was the arrival of the ‘Elf on the Shelf’ all the way from the North Pole! The children were busy reading and playing games with their parents during my weekly reading morning when suddenly my head teacher burst through the door with a very fancy looking parcel. She explained that she had heard a jingle outside and when she looked out the window she saw a parcel sitting on the doorstep. Lo and behold, it was addressed to Reception! I asked the children to come and sit down and told the parents that they could either head on home/to work, or stay for the grand opening. All of them stayed, camera phones in hand! The two special helpers opened the parcel which is when I appeared to suddenly realise who it was. 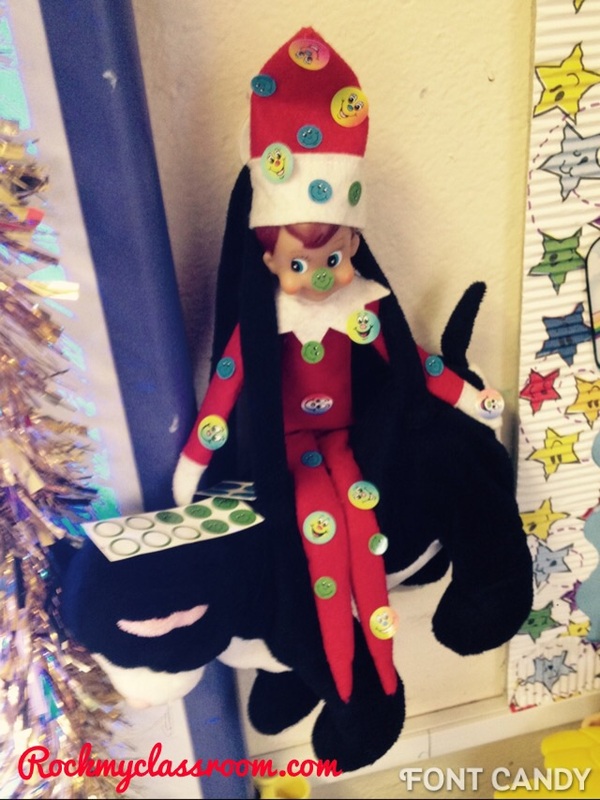 I explained that this was the elf who had visited my class the year before. The children were SO excited. Their wee faces were a picture! Parents then left and I read the story to the children. 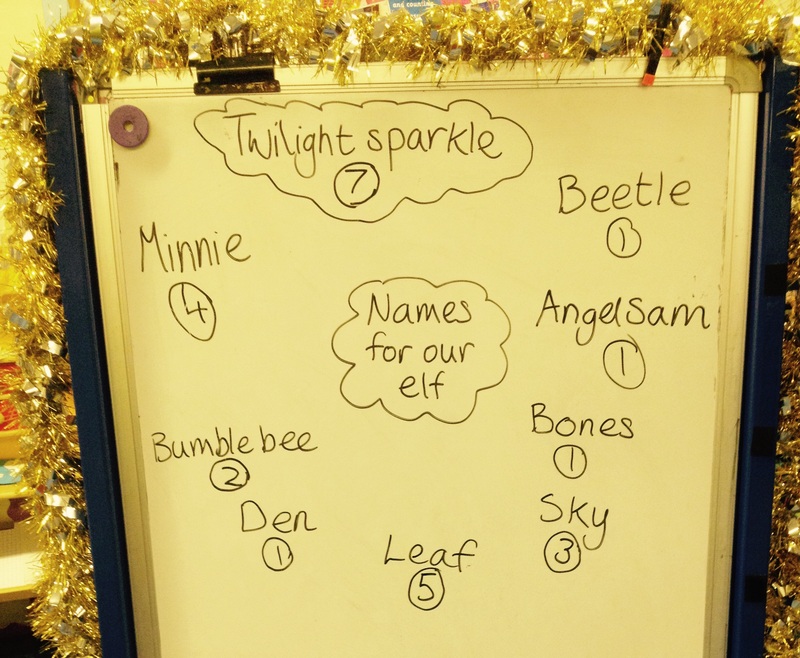 I did a quick brainstorm about what we could call him, but on getting suggestions like baby, mummy and dog elf (😂), I decided that they had been at the carpet for too long and suggested that they write their ideas down for me! 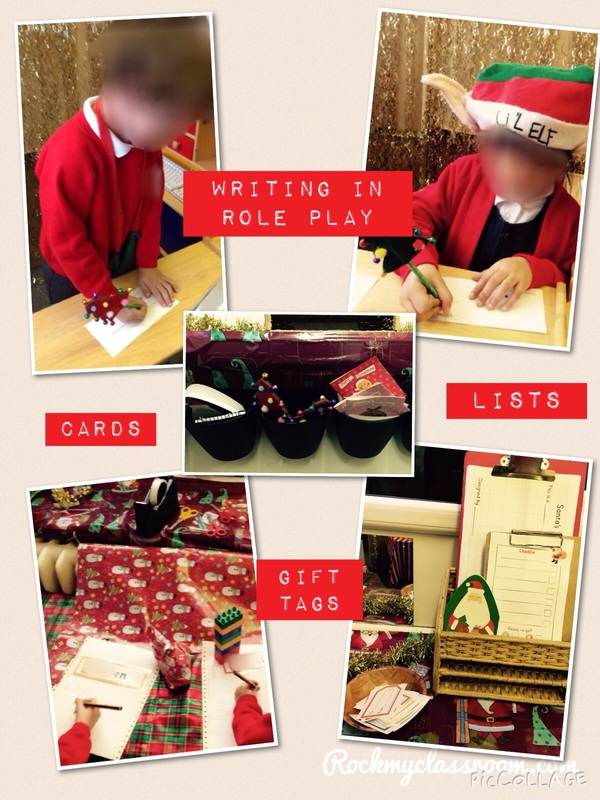 I also explained that my TA would need some helpers to clear out the school role play area and that if they had any suggestions about what we could turn it into, to write it down. By the end of the day I had a huge pile of shopping lists left on my chair! 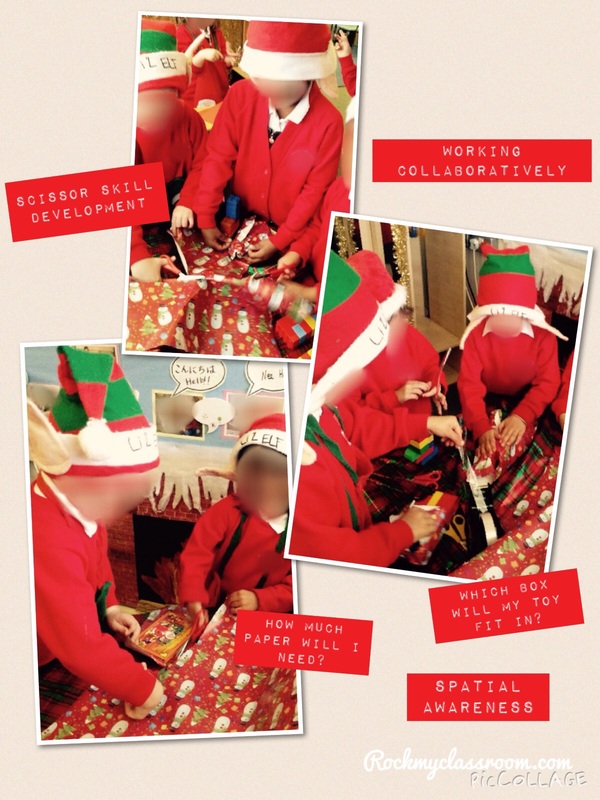 After the children left school for the day I cranked on the ‘Now That’s What I Call Christmas’ album and started to decorate the class and make Santa’s workshop. Both my TA and I ended up staying until 7pm because we got so carried away! You might have noticed the postbox outside the workshop. 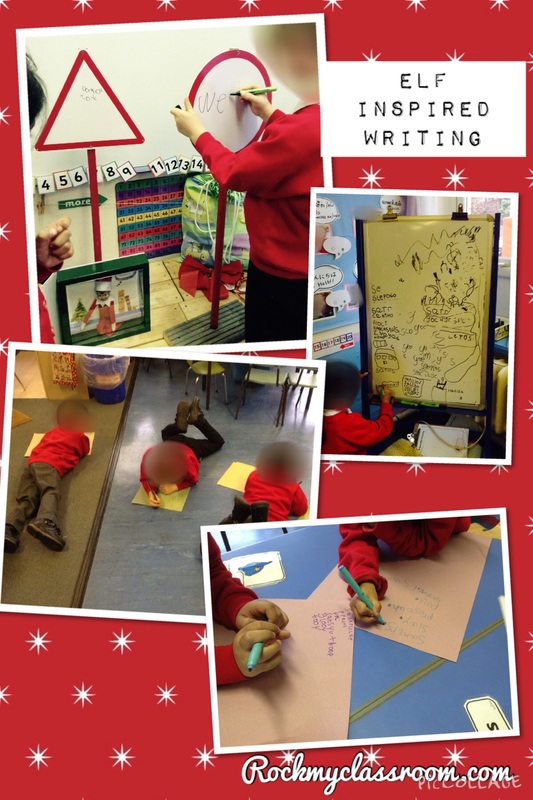 It was for the rest of the class to post their Christmas wish lists. I set out 3 Smyths catalogues on the table along with some glues and pens and suggested that they cut out all the things they would like and have a go at writing a label underneath. The table was absolutely crammed and was equally popular amongst both boys and girls. Once they had finished the elves would check the post box and have a go at making the requested toy! 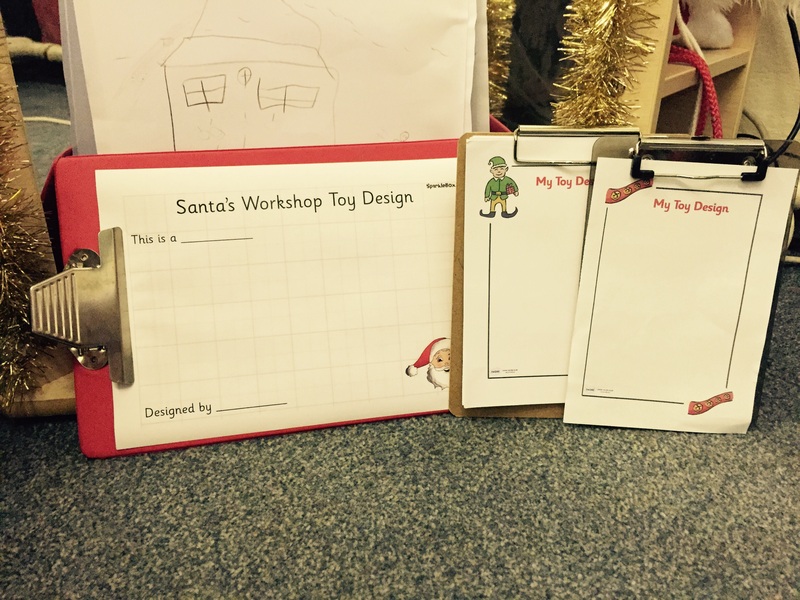 I also made sure to include lots of writing frames in Santa’s workshop – notebooks, writing frames from Twinkl, pound shop cards and envelopes, gift tags and some fancy pens! 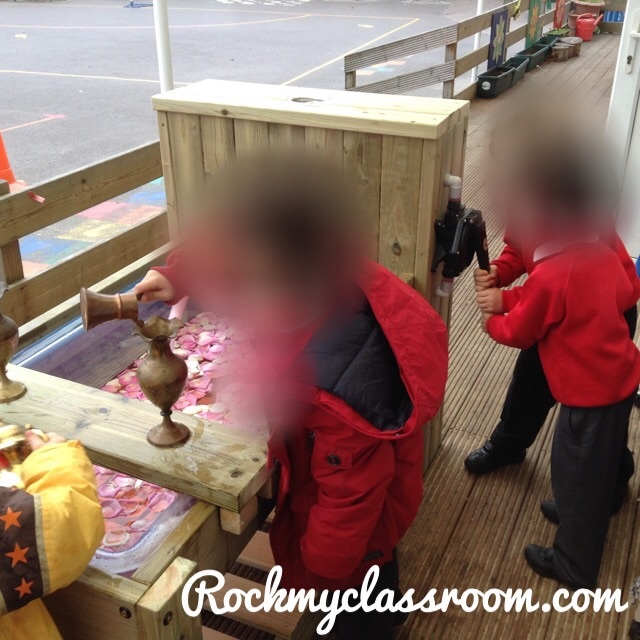 The children absolutely adore their new role play area and I am getting such a high level of engagement and attainment. 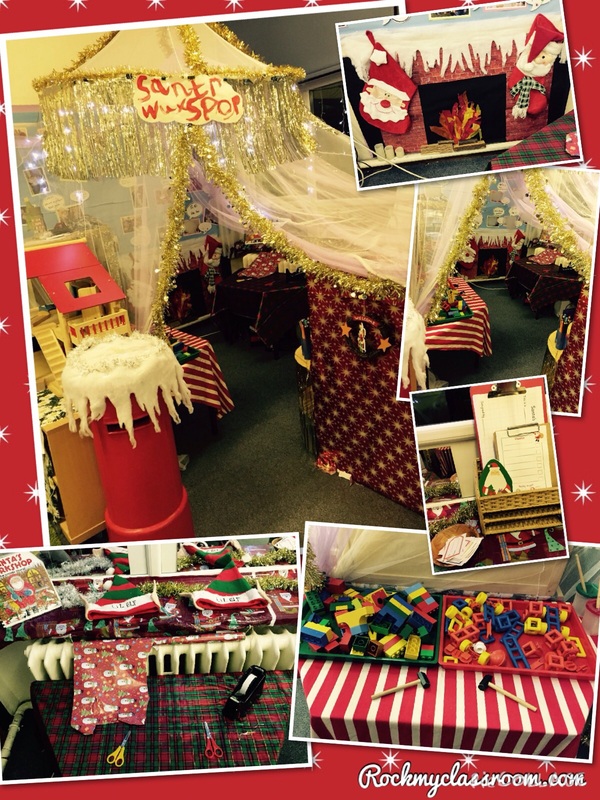 I would highly recommend that if you do have a Santa’s workshop in your class, plan for an adult to spend a few days in it modelling play possibilities and developing children’s skills. Last week my eagerly anticipated water pump tray finally arrived from TTS. It it has been such a big hit with the children. It is really well made, the pump element is very appealing and there’s a handy wooden shelf that fits over it. 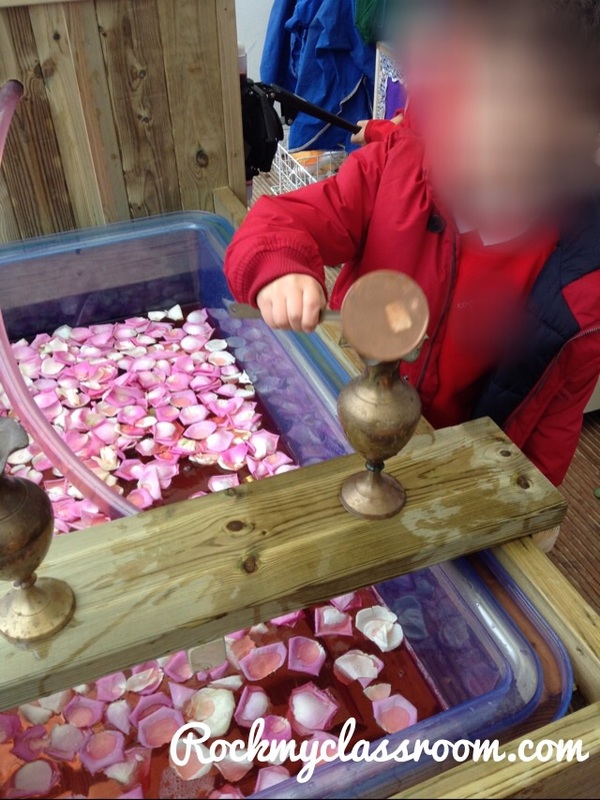 I always find that children need and seek out a flat surface to put their measuring cups and jugs on, to free up their hands and to give them the freedom to bend down to the level of the jug or whatever and watch the water rising. 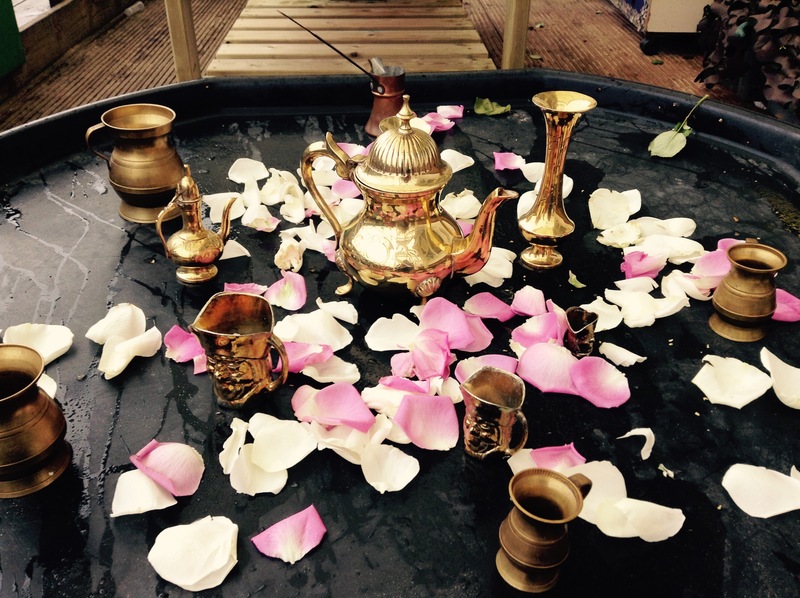 Having been inspired by ABCdoes I recently started purchasing brass and metal jugs/pots on eBay and in charity shops. I thought that they might appeal to the children because of the feel and weight of them as well as the shine, texture and reflective surfaces. I decided to unveil my new collection this week and threw in some flower petals and strawberry scented red water to add an extra bit of interest. 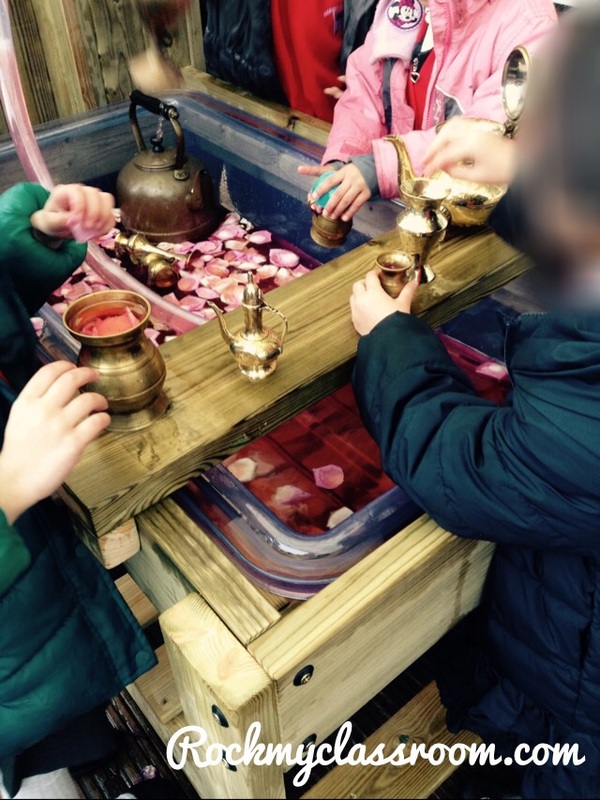 The children were in awe and genuinely thought that the jugs etc were made from real gold. 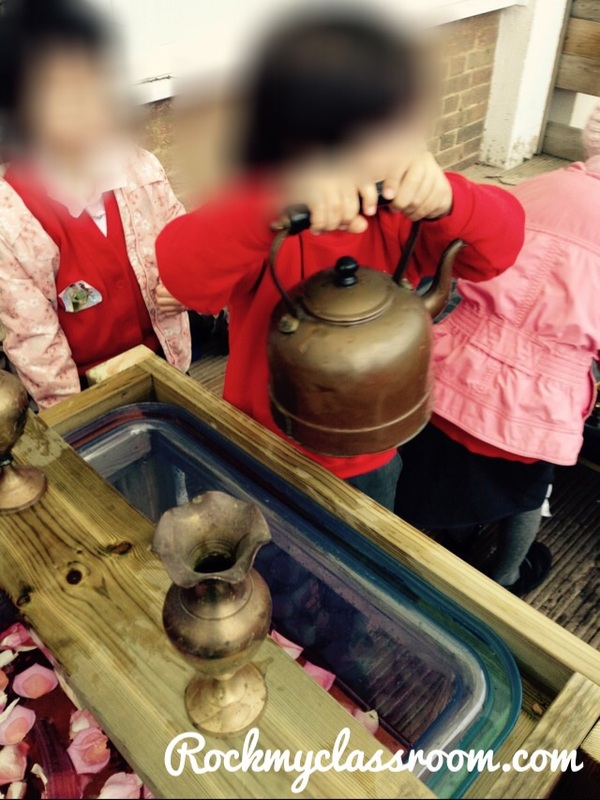 They reminded each other to be gentle and careful because the pots were so ‘delicate’! The boys absolutely love the pump element, which is also fab for developing their upper body strength! 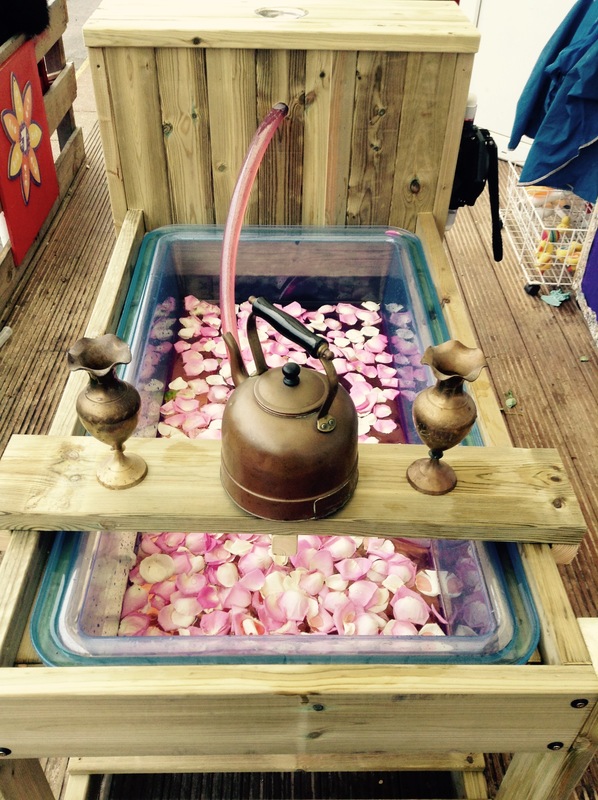 Another outdoor water tray tip I have is that you need a lot of space. I have cleared the whole deck area and put a raised tuff spot nearby, along with large scale guttering and stands, so that the children have the space and freedom to play on a large scale. After reading a blog post about objective led planning on the foundation stage forum, by Early Years guru Alistair Bryce Clegg, I decided to change my planning this year. We’ve been doing objective led planning since late September and I’m loving it! The premise of objective led planning is that you take the learning to the children rather than calling the children to set activities. 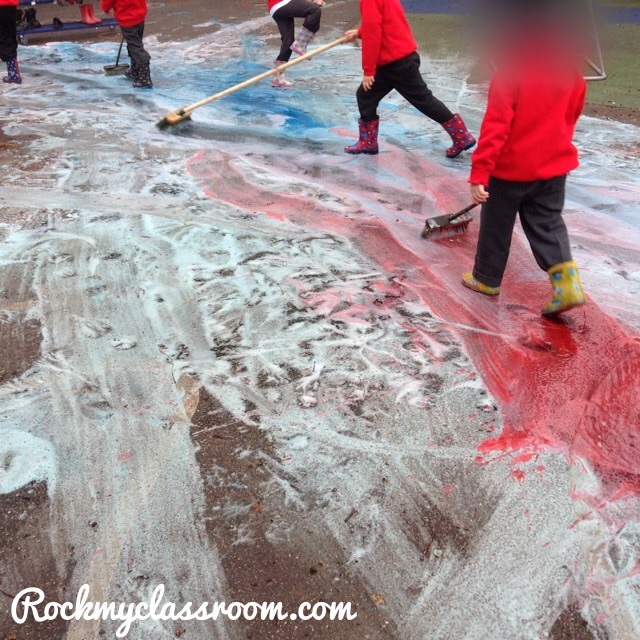 You really have to be able to think on your feet but the result is that the children are so much more interested and engaged. It also gives you and your support staff a clear focus for the week. 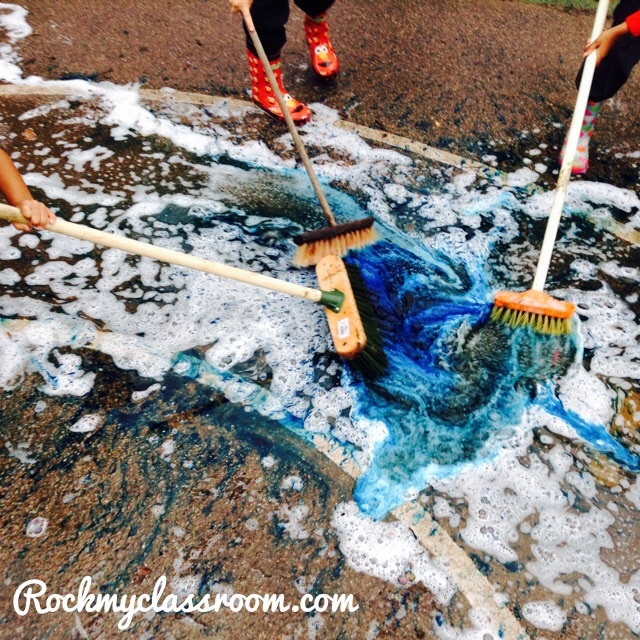 Once we’ve worked with every child we revisit the children who struggled or were on the verge of grasping something. It’s a highly efficient way of working and I feel confident that I know exactly where the children are and can clearly see their progress from week to week. This week my objective focus has been on addition. Seeing the crowd of children that had gathered around the funky fingers bead skewering activity, I knew I’d be onto a winner if I could somehow link it to addition. I asked the children to roll 2 dice and then add the total. Once they had done that they could then skewer on that many beads. They kept going until they got right to the top of their skewer, offering lots of opportunities for teaching different addition strategies whilst giving me the opportunity to video and assess their newly learned skills. 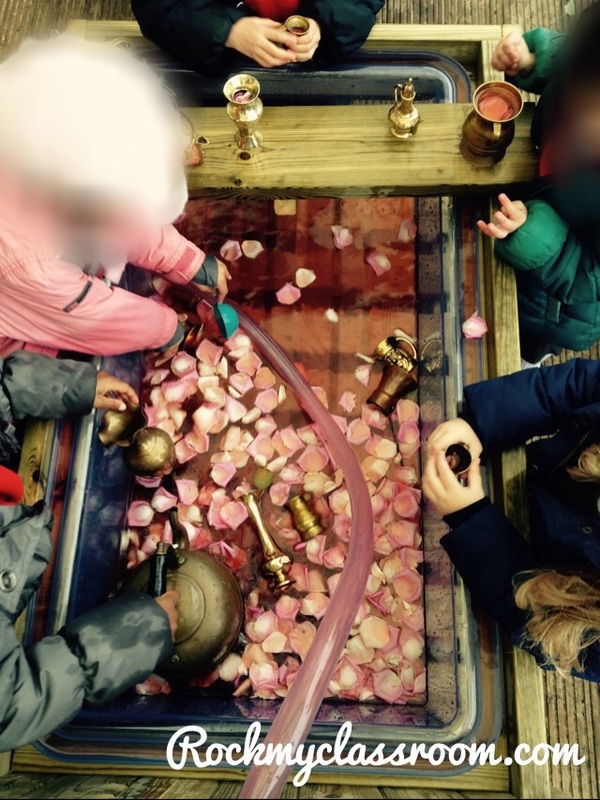 Introducing a focus at this activity didn’t detract from the children’s enjoyment, but actually heightened their enjoyment and engagement. Sorry for the minging photo of my objective led planning sheet, but I thought you would rather see it than not! If the children automatically recognised or subitized dice patterns I introduced the concept of counting on to find the total. One of the children was also keen to show me how she could count the dots on the dice in 2s and 3s! Their designs are so gorgeous that I think I might use them as a tie dye effect backing for a display. I just hope it doesn’t look too psychedelic! Whilst on the topic of colour I thought I’d also share a non-numeracy based activity this week. I bought some sugar shakers and added powder paint. 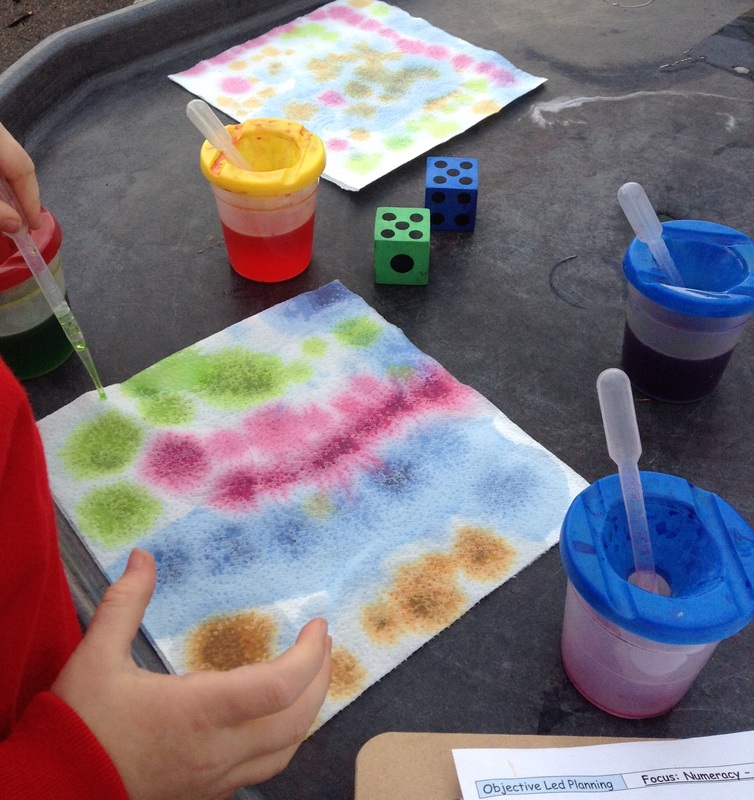 My TA sat with groups of children and showed them how to use the shakers and pipettes of water to mix and make various shades of paint. 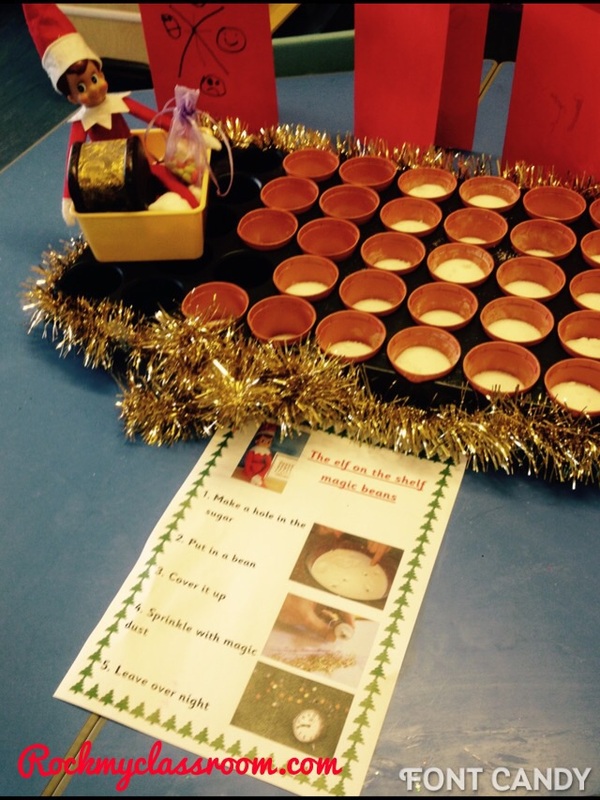 The children absolutely loved it! 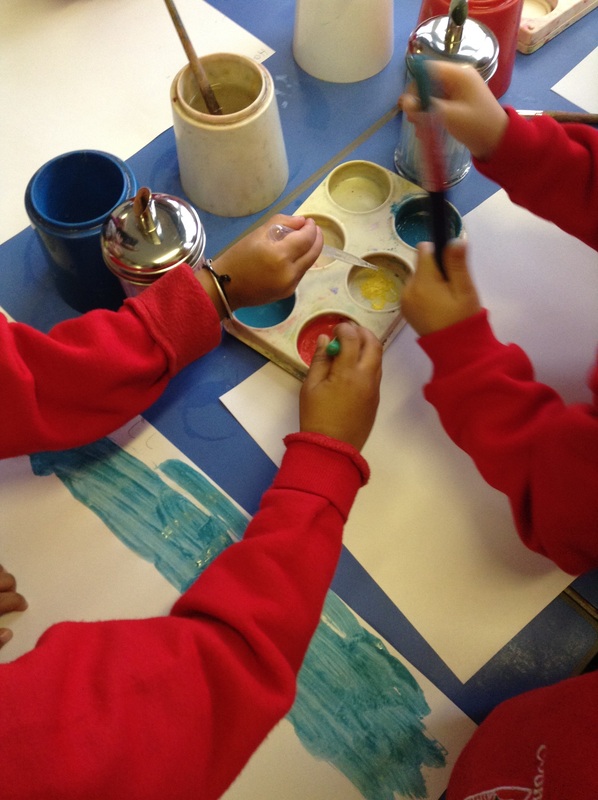 We intend to set up a paint mixing station in the class from next week, now that they children know how to manage it. That’s all for now folks. Thank God it’s Friday tomorrow eh?! An early years advisor I was talking to recently said that she had a group of NQTs who weren’t confident about teaching phonics, so I thought that I’d share a typical phonics session with you this morning, to hopefully inspire you NQTs out there! I started teaching phase 2 sounds this week. I follow the letters and sounds guidance in conjunction with Jolly phonics visuals, actions and songs. I use a turtle hand puppet to introduce our phoneme each day. The turtle feels a bit shy at the start and hides inside her shell. The children chant..
‘Tina turtle, Tina turtle, what’s our sound? The turtle then pops her head out with a phoneme card and jolly phonics sound button in her mouth. One of the children then presses the sound button so we can all hear it. When I taught P this week I changed things around a bit. I put a happy birthday badge on Tina and left the children a note explaining that it was Tina’s birthday and that they had to open up her presents to look for clues about that day’s phoneme. Lo and behold, all of the presents started with a p – penguin, polar bear, pizza etc etc. From under a piece of pink fabric I then revealed a peppa pig cake and some pink birthday candles (linked to the jolly phonics action). I then modelled how to write the letter and got the children standing up to do large scale air writing and then to write on each other’s backs. For the more able children I encouraged them to write the words pin, peg etc on their friends back. On the board were the words ‘postman tap’. 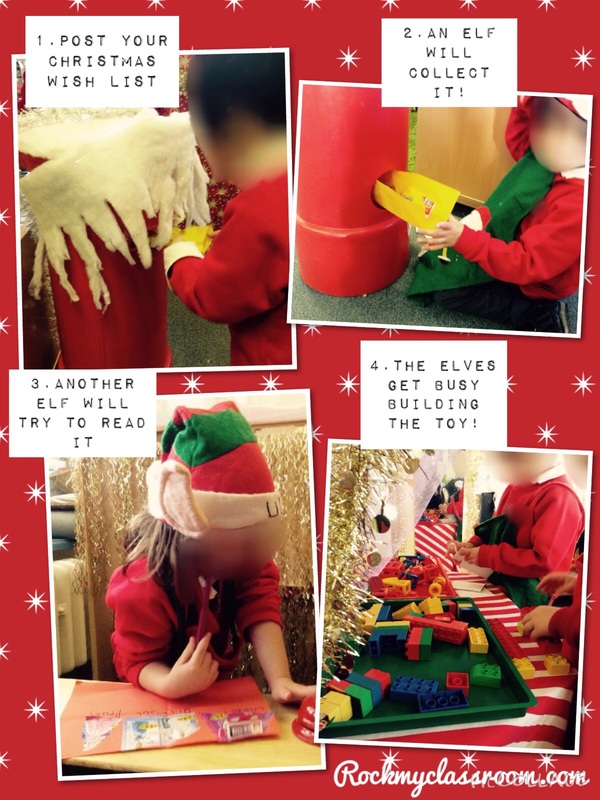 The more able child read the word postman and then the class had a go at sounding out the word tap. Realising it was the wrong word, I asked the children to turn to their talk partners and have a go at segmenting the word pat. I then chose a child to come up to the board and rearrange the letters to spell the the word pat. Finally I opened the last present which turned out to be a Postman Pat DVD! We then lit the pink candles on the cake and sang the Jolly phonics song.. The special helpers then blew out the candles. After that I reviewed the letter sound once more. The lesson took about 15-20mins in all. The children then had a wee slice of the cake and went completely bonkers because of the sugar rush! 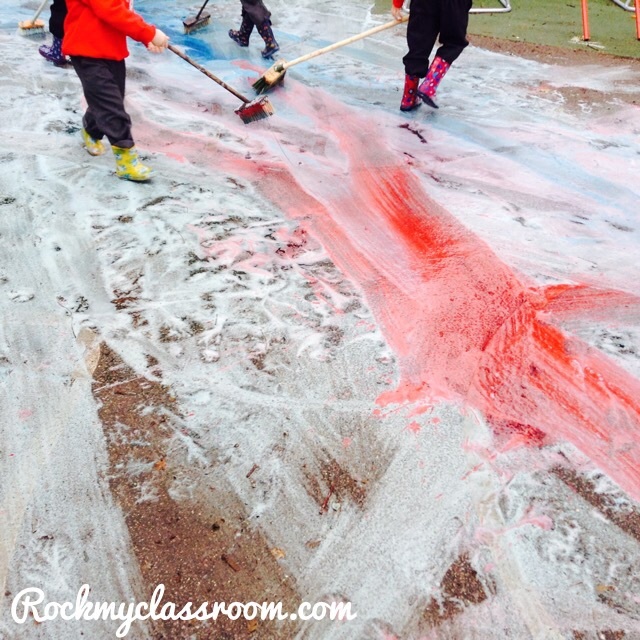 That afternoon we set out pink paints and encouraged the children to practice writing their new sound. The more able children had a go at writing simple CVC words beginning with p.
At the end of the day I put on the postman pat DVD and let them watch one episode. Last year we made pizzas in the afternoon, but we didn’t have time this year, but this is something else you might like to do. 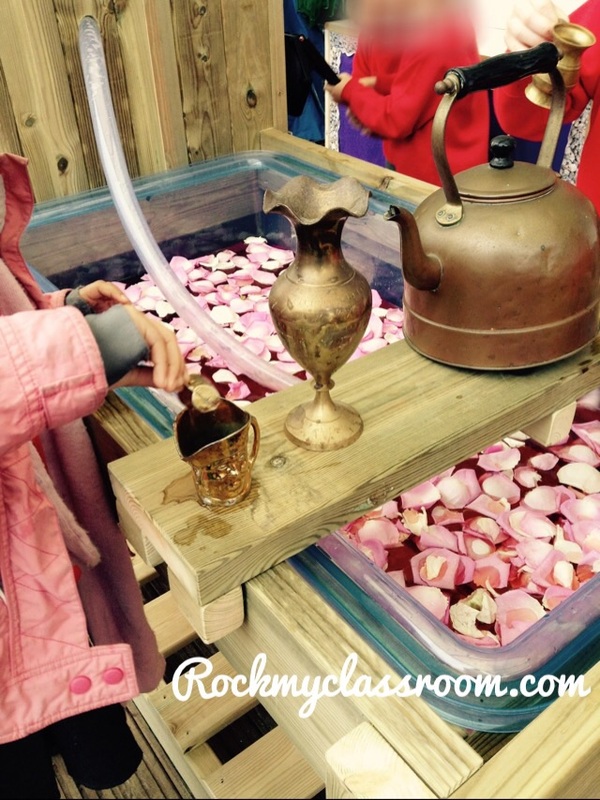 I believe that with each sound, you should try to give the children an experience to help them remember it. It can be as simple as you like e.g. My TA and I played a game of tennis across all of the children’s heads when I taught the sound T. With the amount of giggling that went on I definitely think that sound will stick in their heads. 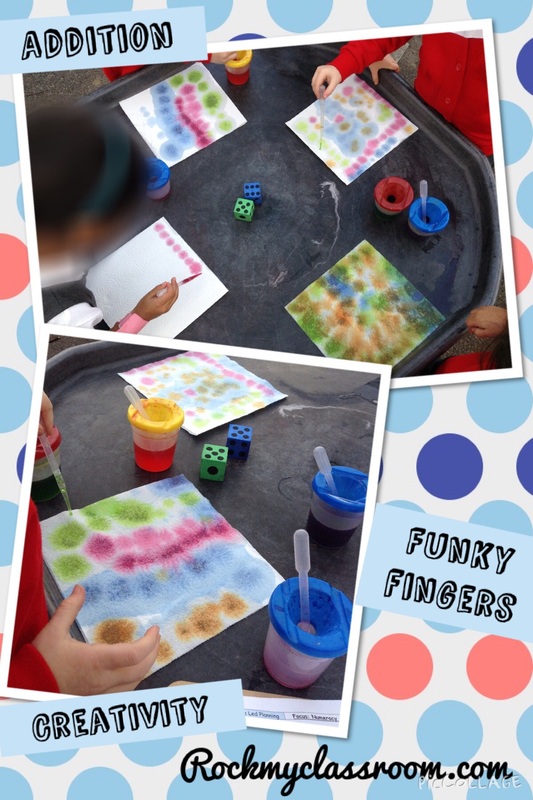 Towards the end of the week I put an initial sounds sorting activity out on the funky fingers table…. I hope this gives you some ideas for your phonics sessions. Best of luck! Today’s long awaited blog post is dedicated to the online learning journal, Tapestry. 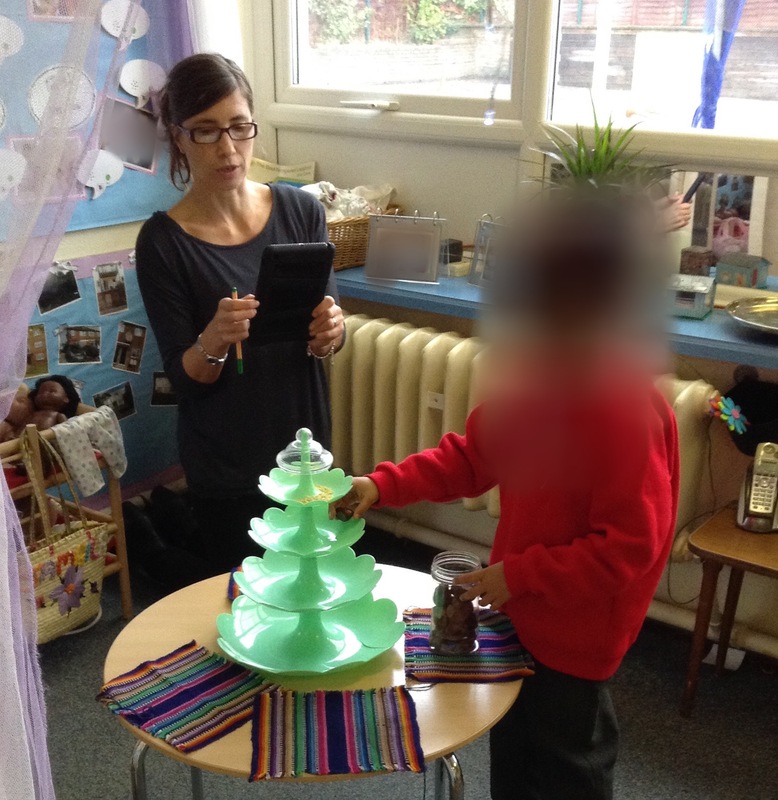 I’ve been using it in my Reception class over the past year and a half and cannot recommend it highly enough. This is my sixth year in Reception. I’ve taught in 3 different schools, and up until last year I was keeping evidence of children’s’ learning in the traditional scrap book format. This, as you all know, involved taking reams of photographs, downloading these onto a computer, printing them, guillotining them, sorting them, sticking them into books and, finally, annotating them. Parents would get to oooh and aaah over their child’s special books about once per term during parents meetings. Conscious that parents weren’t being involved enough I trialled sending their books home after these meetings, in order for parents to spend a little longer looking through the observations and to add in some observations from home. This only lasted a term because some books took weeks to be returned and, in one case, never came back!!! I had had enough! 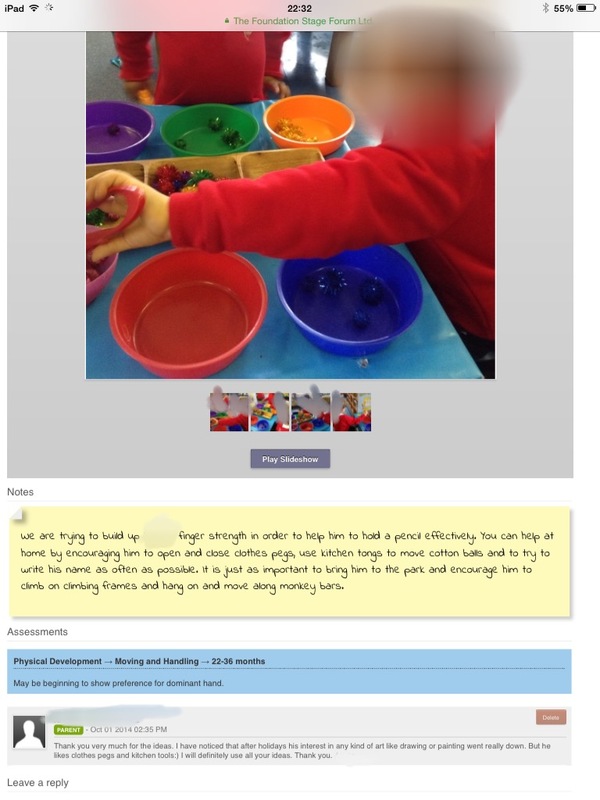 When I applied for an EYFS leader position in May 2013 I accepted the post under the condition that I would be allowed to record evidence in an online journal. Thankfully my new head was willing to take a leap of faith and gave me the go ahead, purchasing iPad minis for me and my team. Hooray! My next task was to convince my new TAs! I trialled Tapestry over the summer and felt confident that anyone who was able to use a smart phone would be able to use the app. They both claimed to be ‘rubbish with technology’, but thankfully they were also keen to move away from all the photograph printing and sticking and so were willing to give it a try. When I mentioned on social media that I was going to do a blog post about tapestry I was inundated with questions, which I hope to answer as best I can below. Please do bear in mind though that I am by no means an expert and have not received any form of training. What are the benefits of using an online learning journal? First and foremost –it promotes a strong partnership with parents. Theyhave immediate access to their child’s learning. They can leave comments and also upload their own observations from home. 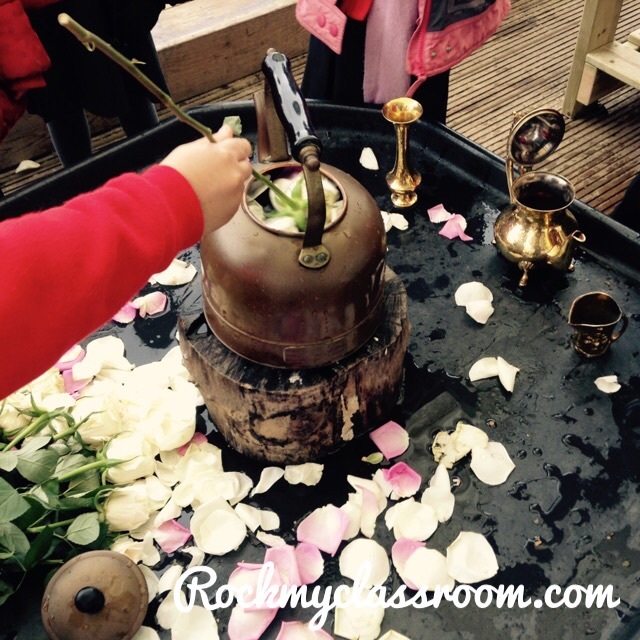 Parents gain a better understanding of the EYFS curriculum and appreciate the value of learning through play. You can link each observation with EY statements, characteristics of effective learning and the Leuven scales. You can choose whether or not to make these visible to parents. I tend to make statements visible so that parents are left in no doubt as to the wealth of learning that has gone on in one observation. The video function is fabulous and allows you to interact with and talk to the child throughout, without having to frantically write everything down. You can use Tapestry to contact and inform parents e.g. every time we teach a new phoneme I ask my TA to record my introduction so that parents are clear on pronunciation and the corresponding Jolly Phonics action. We tag every child in the class so that it appears in each child’s profile. It offers the practitioner the opportunity for some self-reflection. 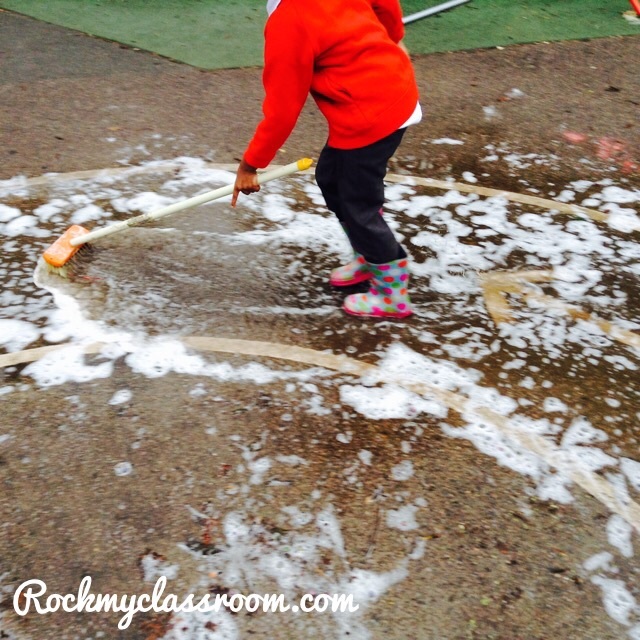 I have learned a lot about my questioning and involvement in children’s play. There are times I have watched a video back and kicked myself for asking too many questions! You can make whole class, group or individual observations. You can also go back and edit the observation before ‘publishing’ it and making it visible to parents. You can add as many family members to receive notifications as the parent wishes – Grandparents, older siblings who have left home to go to uni etc. It is very reasonably priced. For 60 pupils in Sept 2013, it cost me £36. Prices have gone up a little since, but not by much and with some programmes charging as much as £600, I think it is a bargain. It is incredibly user friendly and simple to upload observations via an app. As I mentioned above, if you are able to use a smart phone, you will be able to use the Tapestry app. Do you use Tapestry to track children? You cannot enter data by aspect. You have to enter scores one child at a time, which I find more time consuming. As far as I can tell there is no function for strand analysis. It doesn’t appear to generate percentage scores for you i.e. how many children are on track etc meaning you have to work it out yourself. I’ve been informed however that this is something the tapestry team are working on as we speak. I currently use my Local authority spread sheet system to track my children, although our school is soon moving to O-track which appears to be very user friendly. 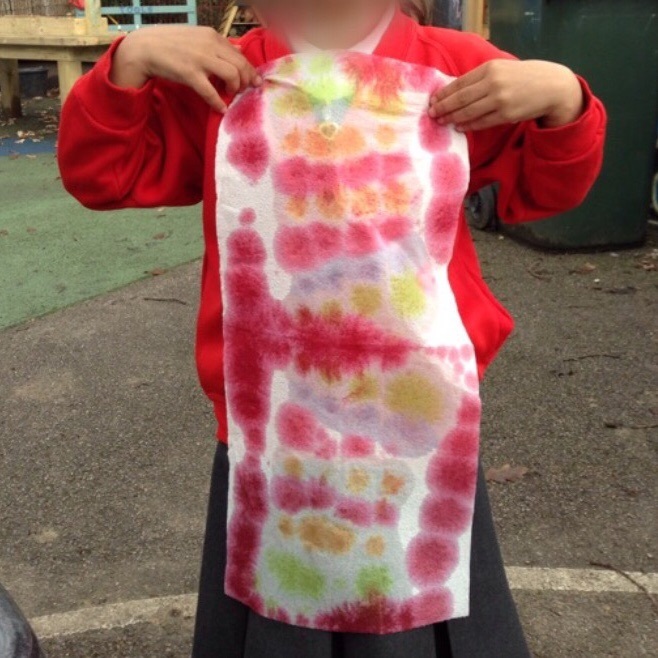 Does Tapestry record how many observations in each area there have been made for each child? Yes it does, although pulling up this information isn’t the simplest as you have to navigate your way through the analysis section. Do you still have paper scrap books in conjunction with an online journal? Yes, I do. Because there weren’t any other settings using Tapestry in my local authority when I first started I was frightened to completely move away from paper journals. We currently keep children’s collage, paintings and writing samples in these special books, but record the processes on tapestry. Can it be used into year 1? Yes it can! 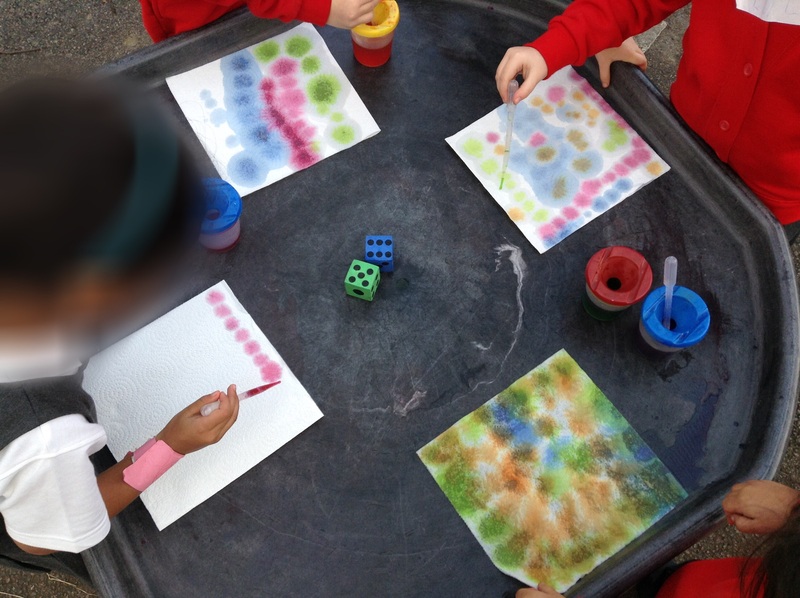 Also, if a child is coming into your reception class from a different setting who are also using Tapestry, it’s possible to transfer all the observations over and continue with their nursery profile, and use their data. Similarly you can electronically transfer your Reception profiles up to the year one teacher should they wish to use it. You can create a PDF document on the learning journal to give to parents. I put these all on CDs at the end of the year. Unfortunately there is no way to save videos as far as I am aware. Does each member of staff need an iPad? I would say yes. Because of how we use Tapestry, in that it replaces all of our traditional methods of recording observations, from photos to post its, it’s important that everyone should have their tablet to hand, so that they don’t miss any learning opportunities. How did the other staff take to Tapestry? As I mentioned earlier both my TAs were initially apprehensive/terrified about using Tapestry. 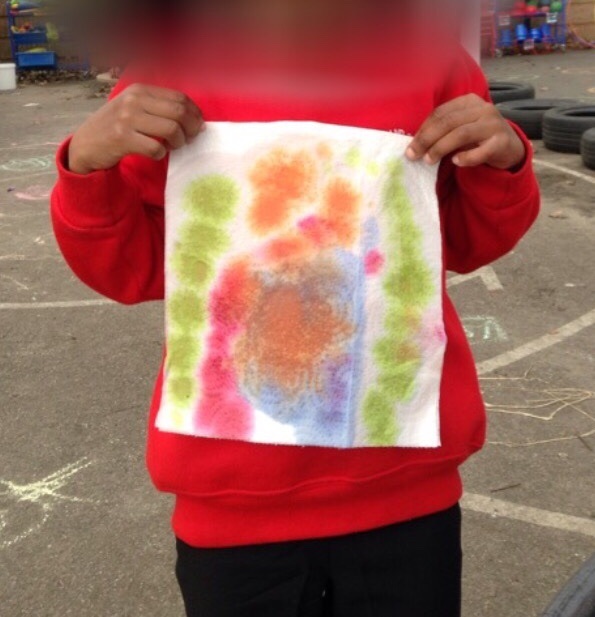 One thing that worried them for example was that they wouldn’t be able to record what the children were saying because they couldn’t type fast enough! They often wrote notes and then transferred these onto the tablet at a later date meaning that they were doubling up and having to work extra hard. As time went on they became much more confident and quicker at typing and so were able to ditch the notebooks! This year I have been encouraging them to use more video evidence and get over their self-consciousness at hearing themselves on video. They now agree that changing to the online journal system was the best thing we ever did. If someone paid you to go back to the old paper system, would you?! Absolutely not! In an era where more and more schools are using social media and blogs to interact with parents, it is only a matter of time before everyone changes to using online journals. Try not to be be scared, just embrace it! 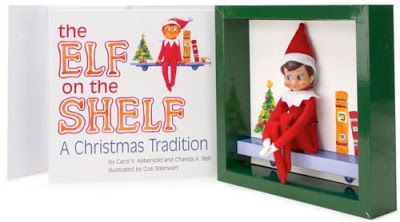 I know this is a very early Christmas post, but I wanted to give you all a heads up and some time to order your elf on the shelf, as some people end up having to order theirs from the U.S. I first heard about the elf on the shelf from one of my favourite Northern Irish photographers Janine Walker. She had recently adopted 3 wee boys and wanted to give them a magical Christmas. She had me captivated; I can only imagine how her boys felt! Basically the elf on the shelf arrives in a box along with a story book which explains who he is. I make a big deal out of his arrival and go to town with the wrapping of the parcel! I usually arrange for the head teacher or the school secretary to arrive with the parcel when the children are sitting at the carpet for my morning session. They explain that they heard some bells tinkling and looked out the window and the parcel was just sitting on the doorstep, addressed to reception. You can imagine what the children’s faces are like at this point! The one important rule to remember is that the elf uses magic power to fly back to the North Pole each night. If the children touch him he will lose some of his power and might need to spend a night recuperating in elf hospital. Sad times. One of the first jobs you have to do is to name your elf. In the past I’ve had Twinkle, Bompodomp and as you can see last years choice was Twilight Sparkle, which I realised afterwards is a character from My Little Pony! He raided Paws the cat’s sticker collection one night! The children all planted a magic bean (tic tac) in sugar, sprinkled it with magic dust (glitter) and left them over night. Just look what happened…. 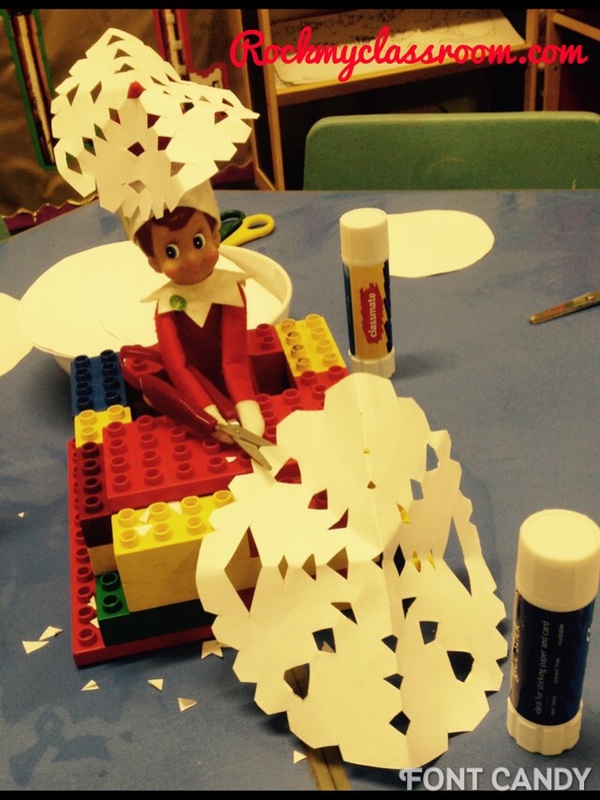 I hope this inspires you to get your own elf on the shelf because it is honestly one of the most magical and rewarding things I’ve done since becoming a teacher. The looks on the childrens faces in the morning are just priceless. So many of my friends have bought them for their families and have had such a ball setting up various scenarios. My Facebook feed is constantly bombarded with elf on the shelf antics. Anyway that’s all for now. Hope you’re enjoying a few days off for Halloween. This was very visually appealing and caused great excitement. 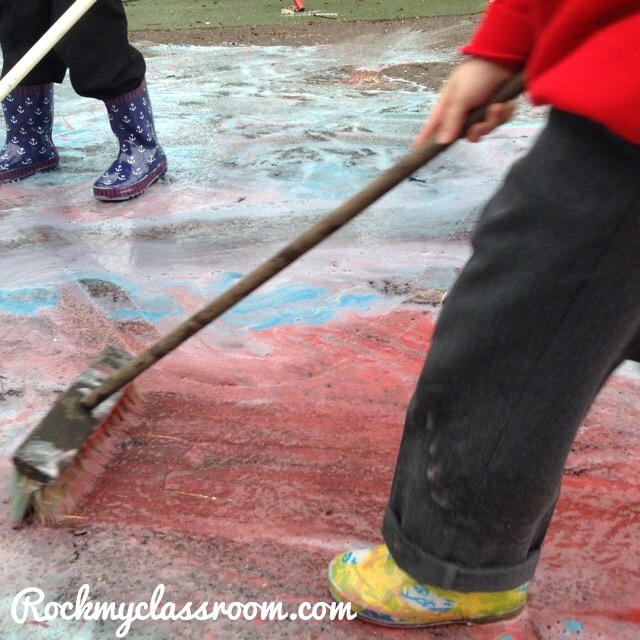 Children began to pour outside and we soon ran out of brushes. 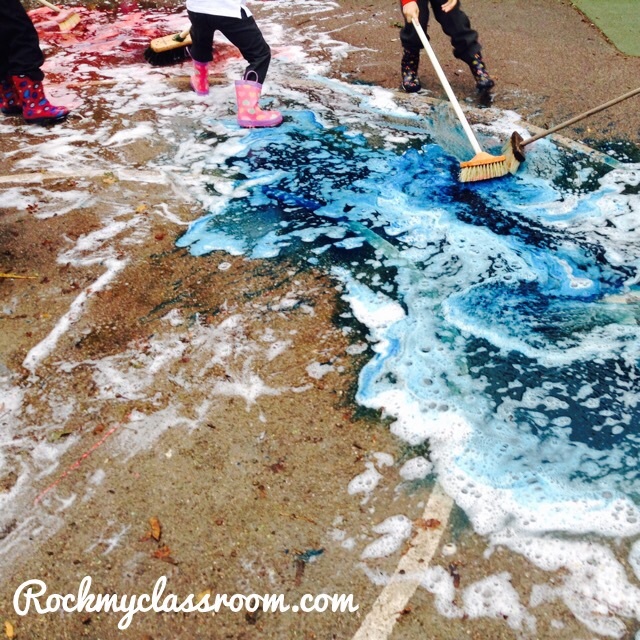 The puddle soon turned into an enormous colourful foamy froth which lent itself to some fabulous large scale mark making. 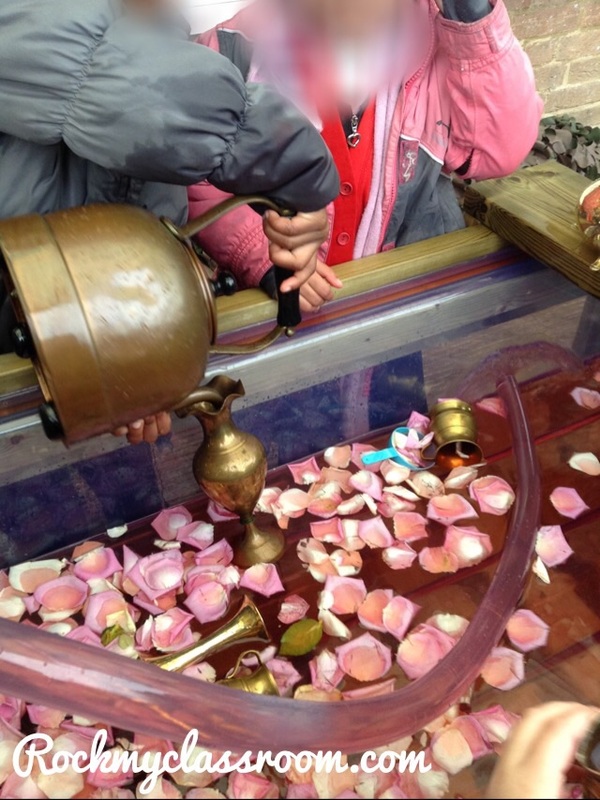 It also made the loveliest sound, similar to snow, so a multi sensory experience in all! When my husband saw these pics he asked was it not really slippy? It honestly wasn’t at all because the ratio of fairy liquid to water was relatively low because of the size of the puddle. 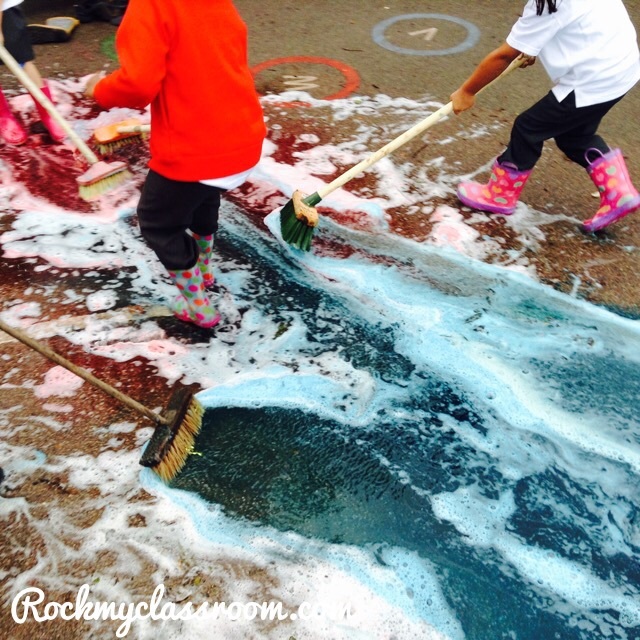 I hope this inspires you to have fun with your puddles outdoors. 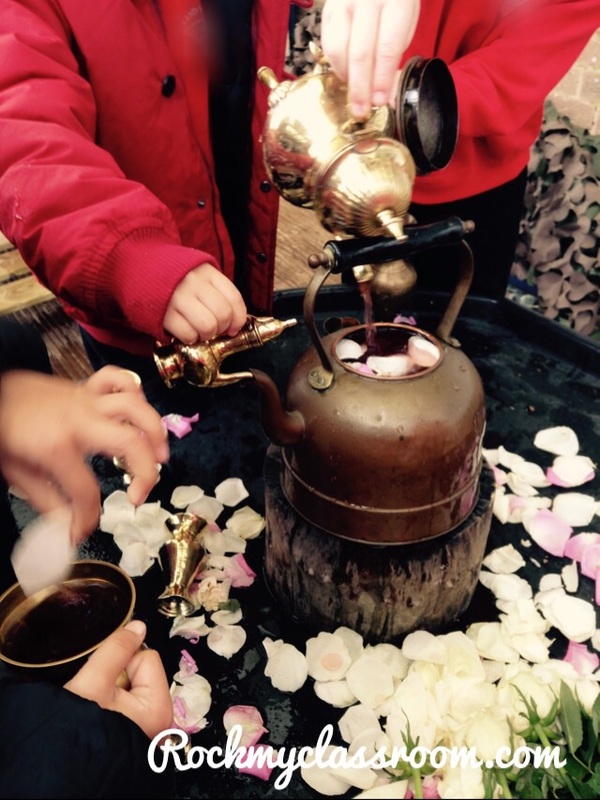 If you have kids maybe try it out with them over the half term?